Sign up for a teacher account online at Showbie.com, or download the Showbie app and create a teacher account when you start the app. Tap the + icon on the bottom menus to create a new class. Each class is given a unique code for identification. Distribute the class code to your students. 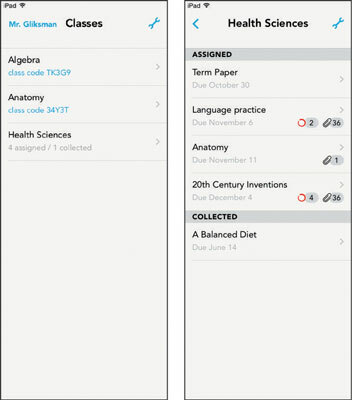 Students also need to have the Showbie app. If students don’t already have an account, they’re prompted to create one with a name and password when they first start the app. When prompted for a class to join, they enter your class code. Note that each class has a unique code. 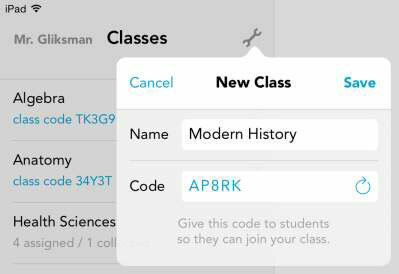 To join additional classes, students tap the Settings icon on the top menus, tap the Join a Class option, and enter the unique code for that class. Showbie is a great iPad app, but it also works with any Internet browser. That means you can use any computer or device to sign in to your account at Showbie.com, and you get the exact same functionality that you have in the iPad app. It’s a great solution for a multidevice environment or in situations where students have use of an iPad at school but need to continue their work on a different device at home.